Do people take notice of your business once the sun goes down? Far too often, businesses spend a lot of time and money installing attractive signage on their stores, but they don’t think enough about what their shops will look like in the dark. With the proper building lighting, you can ensure that your business will get just as much attention at night as it does during the day. Architectural outdoor lighting will light up your business, and architectural lights will shine a spotlight on whatever you want to be the focus of your business at night. 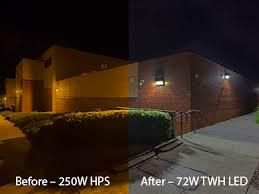 For those businesses with safety concerns, wall packs and wall pack lighting will help keep your business illuminated, deterring would-be criminals and improving visibility outside of business hours. When you have outdoor lighting installed, repaired and maintained properly, you can add peace of mind that your business will look its best at any time of day or night.